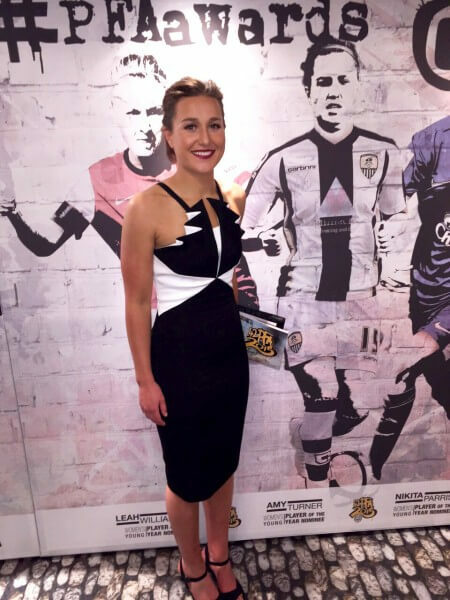 Former Barnsley College student Amy Turner has capped a successful period in her footballing career by being commended at the 2015 Professional Footballers Association (PFA) Awards. The 23-year-old, who is currently studying for a Post Graduate Certificate in Education (PGCE) at University Campus Barnsley, was nominated in the Young Women’s Player of the Year category. The nomination followed hot on the heels of Amy’s debut for the England women’s football team in March and saw her rewarded for her performances in defence for FA Women’s Super League club Notts County Ladies during the 2014 season. Amy tasted even more success in her role as coach of Barnsley College’s under-19s women’s football team, who clinched the Association of Colleges (AoC) Yorkshire and Humberside Female Football League last week. Amy said: “I was shocked and overwhelmed when I found out and it is a very special feeling to be nominated for an award by the players you face throughout the season and to be in a group alongside some great players. “I had a good season at Notts County. I started every game and the Opta statistics showed I made the most interceptions in the league over the season. I received a few man of the match awards and was voted the most improved player.